Protect Marriage Indiana – Launched! 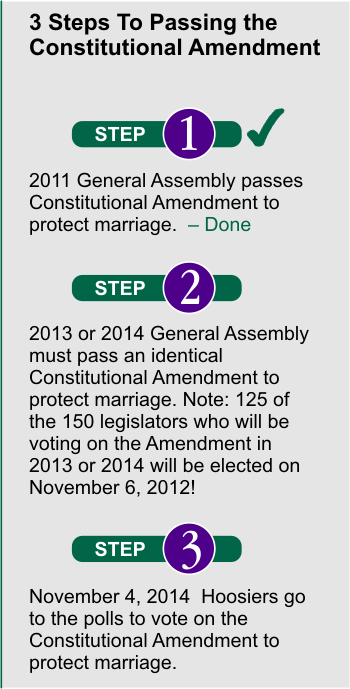 Effort To Support Passage Of Constitutional Amendment! Eric Miller, Founder and Executive Director of Advance America announced the formation of Protect Marriage Indiana, a statewide grassroots effort to pass a Constitutional Amendment in 2014 to protect marriage between one man and one woman in Indiana. Advance America was founded in 1980 and is Indiana’s largest pro-family, pro-church and pro-tax reform organization. The goal of the Protect Marriage Indiana effort will be to create the largest statewide grassroots network in recent memory comprised of individuals, families, churches, businesses and organizations to support the passage of a Constitutional Amendment in 2014 to protect traditional marriage! President Obama Supports Homosexual Marriages! President Obama’s recent announcement in support of homosexual marriages means the issue will now play an even greater role in the November 6, 2012 General Election in Indiana. According to some reports, President Obama could have one billion dollars to spend on his re-election! He could easily spend several million dollars in Indiana on his race and to help other candidates in Indiana who also support homosexual marriages! Be watching for more details on Protect Marriage Indiana including how you and your family, your church and your business or organization can join this grassroots network to pass a Constitutional Amendment to protect traditional marriage in Indiana in 2014!